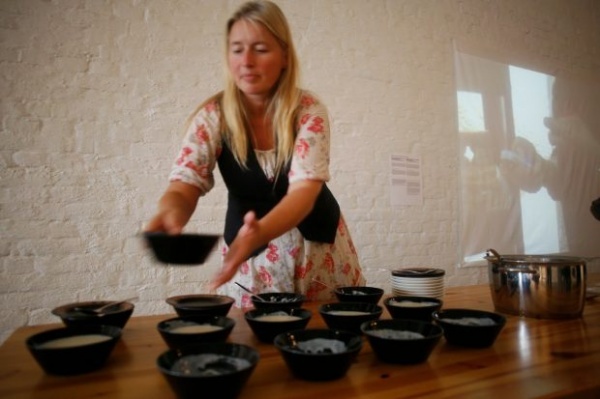 Great article about my work combining fermentation and art by Mark Watson and Charlotte De Cann in their series Dark Kitchen featuring on the the Dark Mountain website. I once had a Korean flat-mate who seemed to make kimchi for all the Koreans in NE England. Washing-up bowls of cabbage in brine filled our kitchen and the end product was delicious. I’ve never attempted to make kimchi myself but I shall try your recipe. Thank you! my kids and I LOVED your article, and spent the evening mulling it all, and then mulled about the word “mulling”! We have been fermenting for years, mostly brine-ing and sour-ing garden veg and making hedgerow homebrews. but i never contemplated the mindblowing concept of the bacteria “downloading” their knowing of local, of indigenous, knowledge. into our living system. how incredible that is to think about. how village living shared this bacteria, and its accumulation of knowing and experience, in what could be a like-minded hive mind, of a collective base-line starting point in collaborative problem solving and cooperative decision making. and how our modern living, moving far away from home place, and eating industrial processed faux foods disconnect us from that collective collaborative cooperative source of local place-based knowledge. we have made a commitment to reconnect and reorient ourselves to our land and the food we forage and grow on it, and to ferment it more and in more ways…to reconnect to place and time and each other…just to see what happens!!! Absolutely loved article. I was recently studying with a shaman in Colombia and he was always making kumis and showing me how to make it but I never got the hang of it but loved the taste! I too took inspiration from this article. My own ferments are limited but an integral part of my routine. Dairy, vegetables and bread. So alive! I am fascinated at the prospect of adding bacterial culture to compost. Seems so “logical.” Curious as to what Eva uses. Perhaps I should throw some sourdough in the bucket and let it grow in the cellar!